Posted on August 6, 2015 August 6, 2015 by et Al. 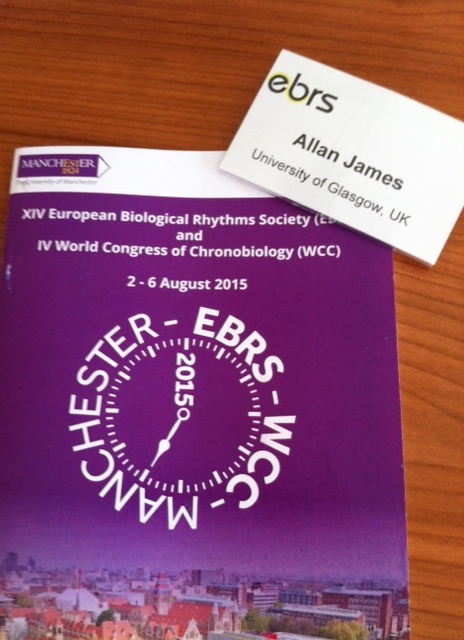 I’ve been in Manchester this week attending the joint European Biological Rhythms Society (EBRS) and World Congress of Chronobiology (WCC). I presented a short communication entitled ‘An hnRNP isoform switch links temperature perception to regulation of the Arabidopsis circadian clock’. It was a wide and varied programme – although plant-clock research was thin on the ground (I was one of only two plant-clock presentations). Another quote that stuck with me was from Ueli Schibler’s Plenary lecture – the quote is, I think, attributed to Bertrand Russell – Mathematician/Philosopher/Writer and Nobel Laureate for Literature in 1950 – when he said “One of the symptoms of an approaching nervous breakdown is the belief that one’s work is terribly important”.